FORECASTERS have cautioned that there is "no reprieve" from the heatwave until at least the weekend as already record-breaking temperatures reach their peak. Parts of Sydney will swelter into the 40s on Wednesday, just a precursor of a 45C high to come on Friday. Canberra could reach 41C today while 45C is likely in regional cities across New South Wales. On Tuesday, Hay, in the west of the state, almost touched 48C. An extreme heatwave that poses a risk to even fit and healthy people is now in full swing in eastern parts of the state. The Bureau of Meteorology (BOM) has warned of "oppressive conditions". Yes, it's summer and heat is no stranger this time of year - but this is something else. 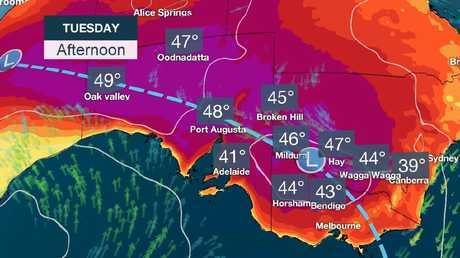 Adelaide could peak at 40C today, but Melbourne and Tasmania will see some relief form the roasting conditions aided by sea breezes. But you don't have to go far inland to see the mercury rise. Bendigo, Victoria could top out at 43C today. Perth is fine and summery today but come the weekend it too will touch 40C. BOM meteorologist Diana Eadie said much of the country remained stuck in heatwave mode. "Temperatures are expected to climb into the low to high 40s - that's eight to 12 degrees above average. "We've already seen some January maximum temperature records fall and we're likely to see many more before this event is over," she said. "The humidity will lead to really oppressive conditions." Authorities across the southeast have urged people to hydrate, check on vulnerable friends, family and neighbours and not to leave children or pets in hot cars. 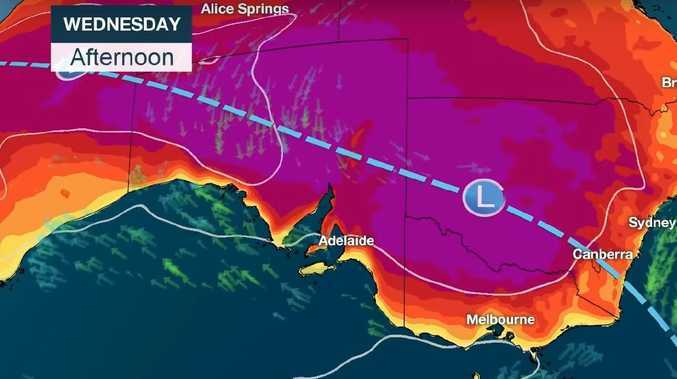 In South Australia, the government has declared a Code Red heat emergency for Wednesday. This triggers extra funding so services for the homeless can be extended while a special phone line will also operate providing regular checks on the elderly and others at risk from the extreme conditions. Sky News Weather channel meteorologist Rob Sharpe explained why this heatwave had been so intense. "High pressure is sitting over the Tasman Sea. 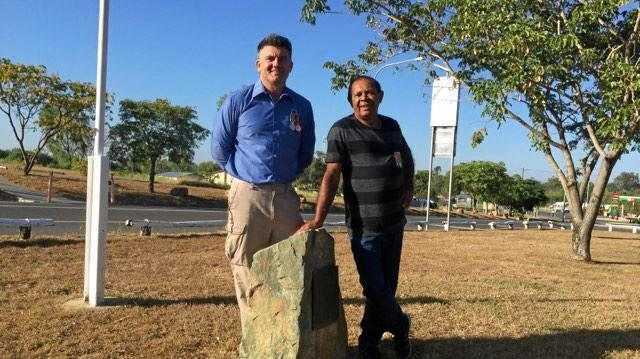 High pressure spins anticlockwise so that's guiding heat from northern and central Australia into southeastern Australia." But with nothing to shake that system up for the next few days, the heat has just kept on building. 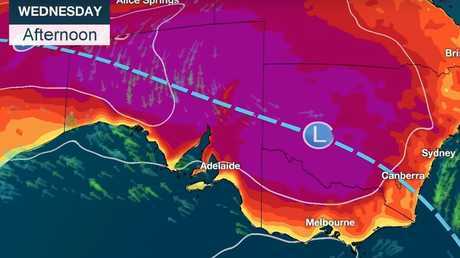 On Tuesday, the BOM remarked: "The heat will build up through this week and people are warned they should not expect a reprieve until at least the weekend in many areas." Looking around the areas most affected, Sydney will see 31C on Wednesday rising to 34C on Friday. But in Penrith, in the west, that rise is from 41C to 45C, up to 11 degrees more sweltering. Across the city, night time lows will be a sweaty 22C. In Canberra, the mercury will likely pass the 40C mark every day until Friday with night time lows of 20C. Albury will see four consecutive days above 40C with Wednesday on 45C. Adelaide is on 40C today and then 37C on Thursday. The weather at the Open in Melbourne is relatively mild - 26C and then 33C on Thursday. Nights are still hot though at around 22C. Hobart will see 23C today rising to 26C on Thursday. In Queensland, Brisbane will continue on a run of sunny days and 33C. Perth will get to 29C today, then 32C on Friday and a scorching 40C on Sunday. It will be 34C and possible storms in Darwin. An end to the huge highs is in sight which will bring blessed relief. "The heat is remaining stagnant through the southeast until we have this cool change on Friday and Saturday," Ms Eadie said. That trough should pass through Adelaide on Friday, Melbourne late the same day and Canberra and Sydney on Saturday. That should shave five to eight degrees off temperatures - far more in western Sydney and regional cities. Penrith will go from 45C on Friday to 29C on Sunday. However, the cold front brings its own risks, she said. "Dry thunderstorms are a particular concern as lightning with no rain may ignite new fires." All that wind may bring the mercury down but, it can also stoke those flames. As such Friday and Saturday will be peak fire danger times.